The United States today is afflicted with political alienation, militarized violence, institutionalized poverty, and social agony. Worst of all, perhaps, it is afflicted with chronic and acute ahistoricism. America insist on ignoring the context of its present dilemmas. It insists on forgetting what preceded the headlines of today and on denying continuity with history. It insists, in short, on its exceptionalism. American Utopia and Social Engineering sets out to correct this amnesia. It misses no opportunity to flesh out both the historical premises and the political promises behind the social policies and political events of the period. These interdisciplinary concerns provide, in turn, the framework for the analyses of works of American literature that mirror their times and mores. Novels considered include: B.F. Skinner and Walden Two (1948), easily the most scandalous utopia of the century, if not of all times; Ken Kesey's One Flew Over the Cuckoo's Nest (1962), an anatomy of political disfranchisement American-style; Bernard Malamud's God's Grace (1982), a neo-Darwinian beast fable about morality in the thermonuclear age; Walker Percy's The Thanatos Syndrome (1986), a diagnostic novel about engineering violence out of America's streets and minds; and Philip Roth's The Plot Against America (2004), an alternative history of homegrown `soft' fascism. 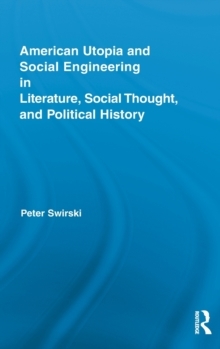 With the help of the five novels and the social models outlined therein, Peter Swirski interrogates key aspects of sociobiology and behavioural psychology, voting and referenda procedures, morality and altruism, multilevel selection and proverbial wisdom, violence and chip-implant technology, and the adaptive role of emotions in our private and public lives.